Buying a TV can be a confusing enough endeavour these days, what with the acronyms and the endless, indecipherable product names. But one thing is relatively certain: if you’re looking for a new TV and want to be ahead of the curve, it’s worth bumping up to 4K. And, with both Xbox and PlayStation now turning their hand to 4K-capable consoles, it’s even more important if you’re an avid gamer. With that in mind, we’ve rounded up the biggest, brightest, most dazzlingly detailed options to help you find the best 4K TV for gaming. 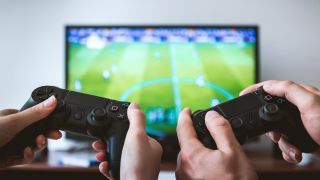 Perhaps the biggest factor to bear in mind when buying a TV for gaming is input lag, the delay that occurs between you pressing a button or twiddling an analogue stick and whatever you’ve just attempted being actioned on the screen in front of you. The higher the number, the worse the lag, which isn’t good news when you’re playing a fast-paced FPS or have buddies relying on you in a crucial co-op. Luckily, many 4K TVs now have special gaming modes that work to reduce this lag. If you’re looking for the very lowest lag, perhaps surprisingly, you’ll find it in our value option, the LG 49SJ800V. For the very best picture though, it’s got to be the Sony KD65ZD9BU. For the best of the rest, keep reading below. For a non-OLED TV, the Sony KD65ZD9BU is suspiciously lacking in backlight flaws, which might not seem a particularly glowing opening statement for our top-choice TV, but it makes a big difference when playing detailed worlds in games like The Witcher 3 and Forza Horizon 3. Reviewers commented on the huge contrast range that worked brilliantly when faced with HDR content, and while, perhaps surprisingly, it doesn’t register the lowest lag speeds of the options in our list, the fact that you can activate the fast-response Game mode while playing in HDR is a huge bonus. And besides, while that rate isn’t overly high, the stunning picture quality all but cancels it out anyway. If you’re after a screen that’ll make those graphics really pop, this is the one. The Sony KD65ZD9BU might be the absolute best when it comes to faithfully recreating painfully beautiful game graphics, but not all of us have two-and-a-half large to spend on a new TV, especially if we’ve just shelled out for the PS4 Pro and a clutch of the latest games. You’ll be pleased to hear, then, that the Samsung UE55MU7000 is a QLED marvel, and a great gaming option, at a much more sensible price. With a 120Hz panel, making for an admirable refresh rate, you won’t be left hanging while you’re in the thick of the action, and the price tag-defyingly thin design and high-contrast screen are a wonder to behold. If you don’t want backlight issues to get in the way of your enjoying the on-screen action, your choices are essentially between our first-choice Sony, or an LG-exclusive OLED TV like this one. The LG C7 is the best of the bunch for image quality, largely thanks to its ability to emit light from the individual pixels themselves rather than from a backlight, resulting in beautiful contrast. Reviewers experienced no motion blur whatsoever when testing out this TV, and revelled in the high-speed pixel response and excellent viewing angles, which mean that even if you’re all crammed in during multiplayer madness, those sat at an awkward angle to the screen will experience the same true colours, deep inky blacks and bright but not blown-out whites as someone sat right in front of it. QLED might have initially been dismissed by aficionados as an off-brand OLED (see above) but Samsung have ably disproved that notion with the QE49Q7F, the starter model in the company’s QLED range. Sure, it’ll still cost you, but at around £1,000 cheaper RRP than LG’s most affordable OLED, with a smaller screen which many will find a bonus, it’s stiff competition. In a smart-looking package, all slim bezels, elegant hardware and superior cable management, reviewers say it lives up to Samsung’s considerable gaming TV pedigree. It’s got a dedicated Game mode that automatically selects when you switch on your console, and perhaps most importantly of all, a really minimal lag of around 24ms, making for insanely fast play. Throw in punchy colours too, and it’s really great all round. We’ll level with you: this 4K HDR TV is far from a flagship, and might not win any awards for refresh rates or pin-sharp picture quality, but at just shy of £500, you wouldn’t expect it to. Easily the most affordable TV for gaming on our list, it’s an HDR gaming-ready model that won’t break the bank, making it accessible to those who don’t have a lot to spend, but still want a chance at the latest tech. That’s something we can definitely get behind. Reviewers found there was a little motion blur, so it might be better kept for slower-paced RPGs, but that the contrast was passable, with the presence of some local dimming. Overall, if you’re looking for a future-proof TV for not much dosh, this might be it. Another affordable 4K TV, this LG model sits at around £550 RRP, and manages to offer a surprising amount for that price. Its HDMI 2.0 ports give the option for 4K gameplay at a zippy 60fps, and the TV’s own refresh rate of 120Hz is nothing to be sniffed at either, offering amazingly smooth visuals that are just right for making the most of the fantastically fluid mechanics of games like Titanfall 2. Best of all? One tester reported an input lag of just 15ms. That’s far and away the lowest on our list, and almost akin to what you’d get on a dedicated gaming monitor, which is pretty incredible anyway, but especially for the low price.